aah.. all ideas and no build..
last night I was pondering Deadlock, and the way it looks like it rotates when it lifts (well, I thought it did), when I had an idea. Imagine, if you will, a tin can (or plastic pot or summat) with the top and bottom removed, and a quarter of the circumference cut out. Now imagine it mounted on its side in a 2wd bot, so that the open section faces forward, and driven by a motor. There'd be a small wedge at the front, as a feeder. Something less blurry and vague than.. The idea would be to ram into bots so they end up at least partially inside the can, then the motor would rotate the can and hopefully pick the other bot up and into it (probably not completely, alas). With a few attachments, the can should also work as a self-righter, I think. Chances of it working (I suspect my sense of scale is wrong) or driving properly are pretty much zero, but I feel like it's worth a try. edit: I just worked it out with proper measurements and stuff, and it's looking a little dubious. As suspected, my imagination and reality are not in agreement. The can has to be quite small to fit inside a 4" cube (pretty much the same diameter as a drink can), and the opening would be too small to do anything much. Cutting it in half might work, tho. Still lots of options to try out! Oh man, I came on here to look for some newbie builds and feel good about my box-on-wheels, but your bots are really good!! I love your updates and your bot designs! So many ideas I hope you get round to showing us! Does nobody on here make rubbish bots that fall apart.....? haha. aw, fanx! glad you like em. mine are pretty rubbish, tbh. my pushbot can't push, and my lifter can't really lift, and i expect my hammerbot won't be able to hammer, and my launcher will probably launch itself.. it's all good fun, tho! a box on wheels sounds like a good place to start. i made life a bit difficult for myself, really. Suspicious Houmous is not dead! I was gonna sideline it in favour of different bots, as I'd been having issues with it, but in the back of my head it feels wrong to ignore it. I mean.. it can do backflips across the arena! None of my other bot ideas can do that. There's one fix I can make that solves quite a few problems. I'm kind've ashamed that I didn't spot it earlier - it needs wheels at both ends, mainly so that it'll have drive no matter where the spikes are. It should also make it a bit more controllable, although it won't stop me reversing into the pit. I can't decide between tracks or wheels.. 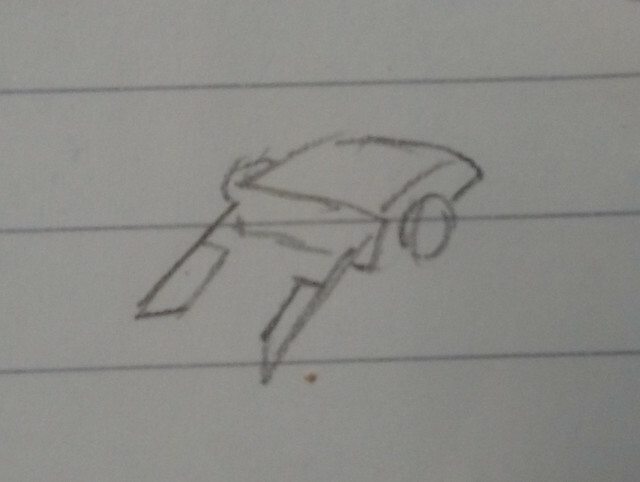 I'm planning it on paper while I'm in work, but drawing two wheels with a lifter between them just makes it look like i'm doodling crude pictures all over my notepad. edit: I'm going for a mixture! 4 wheels, linked with bands within the diameter of the wheels (if that makes sense). I can't really link them with gears due to the lifter getting in the way. Not bad for a first attempt, I reckon. The idea is to use the printed stuff to fix everything in place, and use polycarb for the top, bottom, and probably sides. I'm gonna try printing it out tomorrow, and then I can see if anything fits, and then make a more detailed model if it all fits in. edit: Ha! As suspected, it didn't work out. 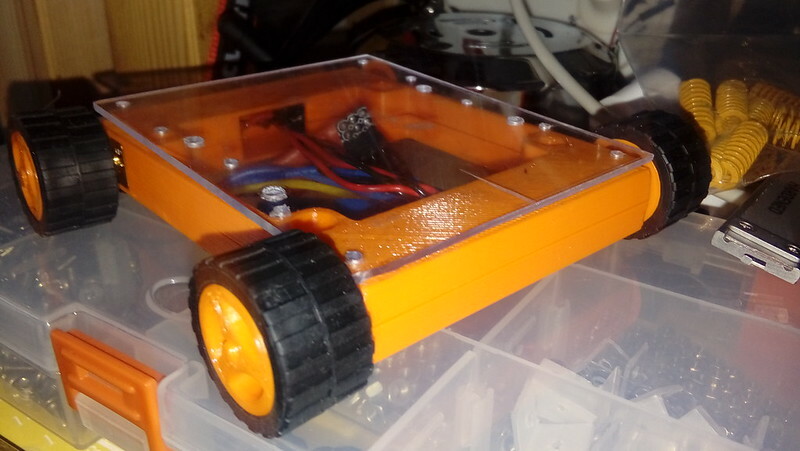 I'd have gotten away with it, if it hadn't been for that pesky Vex29.. And the double-size axles (seems pressing '3' while making a circle creates a diameter of 6).. And the ruddy stupid way the wires come out of the LiPo.. The usual stuff. 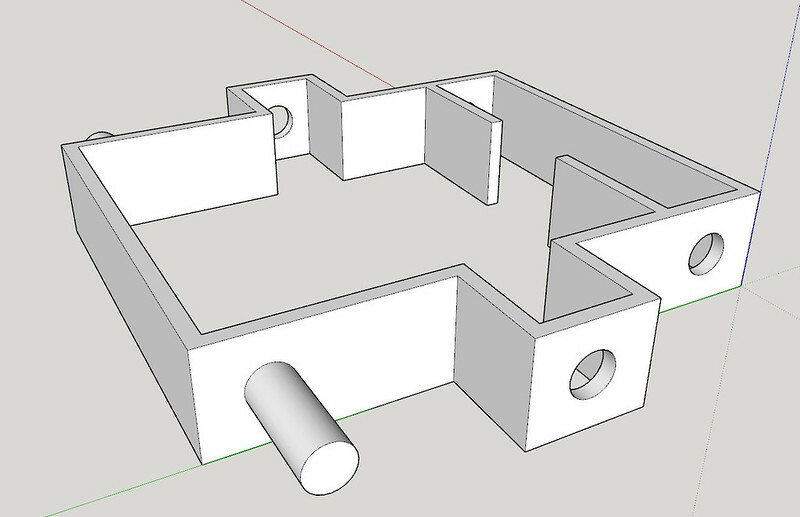 Some progress made, but mainly in fiddling with Sketchup. I've been experimenting with wheels, and I think I now have a hub that can take a 30.4mm lego tyre. Took a while to get the 'D' right, and I've yet to print it. It may not end as planned. Speaking of which, I gave ABS a quick try..
99 problems but adhesion ain't one - it broke in half when I tried to remove it (partially due to poor layer adhesion). ooh, I have another idea for the list - this one's a grabber, using a motor and toothed rails to extend/retract a pair of arms. Compared to some of my other ideas, it's pretty simple, so i might give it a go! I finally produced a version of wheel that I'm happy with. 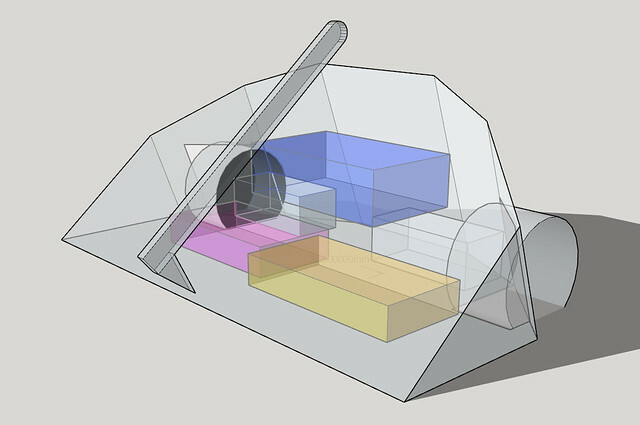 It took quite a few iterations, often because Sketchup behaved in an unexpected manner, but it's all part of the learning process. I think I might have to switch modelling software. It's quite a wide wheel, but it fits the Lego caterpillar tracks, and has a few different tyre options. 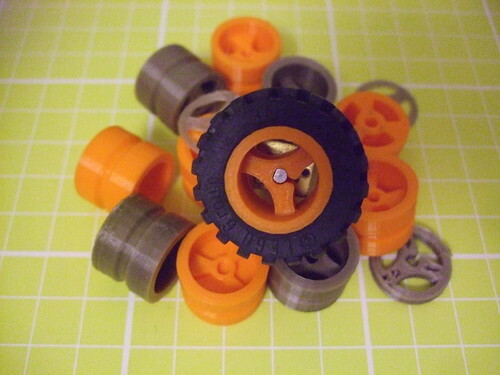 I'm gonna use what I've learned to make a couple of smaller Lego-ish wheels, and then I can design my bots around them. Cool, where have you got your Lego wheels from?? My son has literally hundreds of wheels in his Lego stockpile, so I'm using his stuff at the moment. He only had one set of tracks, tho, so I bought some from bricklink. it's also useful as a reference, as it shows which tyres fit with which wheels (and vice versa). gotta watch for postage, tho. I just hope it works for other people, should anyone try it. I do worry that it only works for me because my printer's badly set up. No weapon mechanism, yet, as I haven't decided what to do. I could just stick a motor on top (the yellow block is a Vex 29), or I could use gears or a belt.. 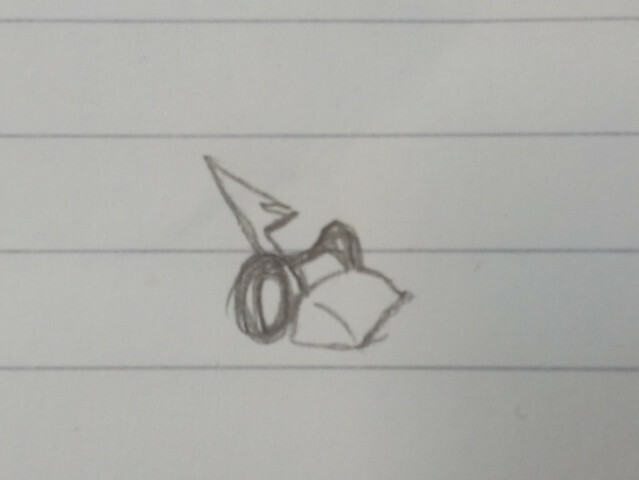 I want the axe to hinge at the peak of the bot, so it can hit forwards as well as backwards. It'll also probably use a nail or something. I've just noticed how much weight is concentrated at the back of the bot. I'm sure it'll be fine! Not much progress, as usual. I don't get enough spare time. It doesn't stop me thinking, tho, and this week I have mostly been thinking 'torque reaction'! I thought it might work for Fermented Melon, with the battery and ESC in the wedge, and the drive and axe kept in place with bearings, but I think it'd disrupt its melony goodness, so I'm gonna build one for a cluster! Initially influenced by Ninja from TIFR, then even more so by Overkill when I found out what Ninja was based on! (I've never watched old Battlebots. ) My initial idea was to use a kitchen knife with the handle removed, so it already has bolt holes, but I think an axe might be better. Preliminary cluster name: Lemon & Slime. Not sure what the other bot's gonna be yet, but my son has to drive it, and he just drives in circles, so maybe a body spinner. 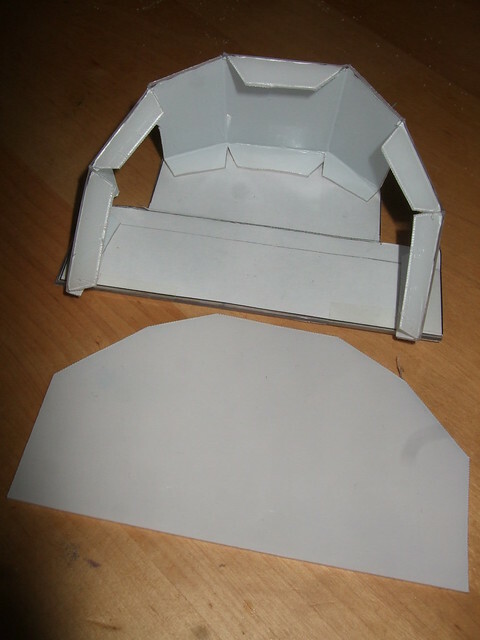 I couldn't work out how to attach the panels, or how to get them into a position that would get under anything. I've now worked out how to get them low, so now I need to see how strong they are when soldered to a rod. I'm guessing not very. the orange pla is just for testing the shape. it'll either be semi transparent or purple, depending on if i can get abs printing in time. there'll also be a lot of refinements, like a wedge, and properly cut polycarb, and LEDs. still not sure about the dimensions, either. at least I'll have something for February! edit: gah! an experiment with PETG has temporarily borked my 3D printer. I need to concentrate on getting Fermented Melon done, so this might be the final version, with no spares! 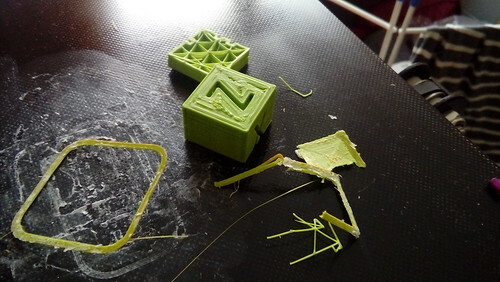 With the 3D printer broked (Ender 3 bowden gap leak. New connector on its way! ), I've turned my attention to Fermented Melon. 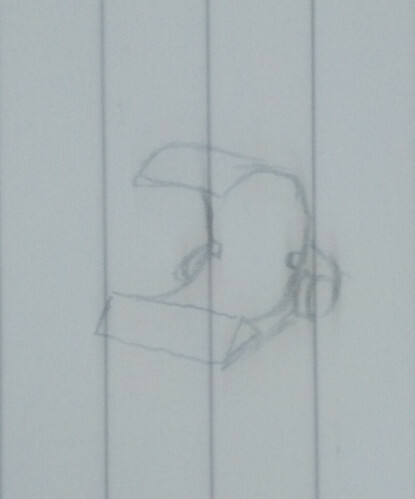 I wanted to try using tabs to connect the parts together, but my bending skills are lacking, and they look a little rubbish. They might look better once painted, or if I cover them with a layer of melon-looking paper. I also need to add some kind of access panel, as there's no way of accessing the internals, which is gonna make things rather tricky! Only 3 weekends to Antfreeze!